I'm on day 9.5 of a 10-day cold. I spent much of that time in quarantine wishing I had the energy to enjoy anything much less do anything. There's Good Sick, when you're too contagious to go to school but well enough to enjoy watching tv. Then there's Adult Sick, when in order not to go to work you have to feel so terrible that you can't enjoy anything about being at home. I was Adult Sick. At first I thought At least I can do some writing or research at the very least. No. Here's what I did: I cuddled up with my humidifier, coughed until my rib cage got out of whack (no kidding! ), dehydrated myself by breathing through my mouth, and watched tv. The Donna season of Doctor Who, and then Godless, which gave me a southwestern accent for a full twenty-four hours and extremely vague nightmares. I'm so good at covering my eyes I don't even know what the "incident at Creede" was. I thought of the comic above while I was watching Godless, which is set in the old west. It occurred to me that a funny thing happens when we depict the past: we feel that only certain things need to be accurate. The treatment of women always needs to be accurate. Women need to be raped; it's a historical truth! But the male characters we're meant to like are never rapists. They're respectful of women's bodies and intelligence even if it's not accurate. Also, the white people we're meant to like are usually sorta nice to people of color and kinda understanding sometimes, even though in reality white people were (are?) overwhelmingly virulent racists. Basically, in mainstream depictions of the past, the most important thing is that "good" white men come off looking decent and even upstanding according to our current standards. Accuracy in this respect is not important. [Godless] recalls the fear and heartbreak embedded in the frontier, as well as the bravery of many of the men and women who ventured there. But it does all this while challenging the notion of the Old West as an embodiment of American values. The conquest of the wilderness, it argues, was built on blood and cruelty. The mythologizing of the rugged individualists and gun-toting outlaws in the genre has led to darker stains on the American psyche that still persist. But it proves that truer stories can be told—ones that capture the allure of what brought so many westward in the the first place, while more honestly portraying history. Those two words at the end bother me: "truer," and "honestly." The only thing historical fiction can be said to do is to show us ourselves as we are now: the society that work of fiction came out of. Who is it about, what happens to them, who created them and when and why, who funded their creation (and what else do they fund), who buys it and buys into it, who critiques it and how. The purpose of historical fiction is not to be educational. It is to say something about humanity that is relevant to the time in which it is written (regardless of whether what it says is what it intends to say or not). Historical fiction is political, like every other everything ever. Toby Litt has an essay in Mutants called "Against Historical Fiction" that relates to this. Before I go into it, let me first say that every sentence of Mutants exasperated me. Toby Litt and I disagree on everything. My marginalia has never been so rude. I enjoyed it immensely! Most especially "Against Historical Fiction." Litt says the historical fiction writer-reader contract is made in bad faith, and quotes a translator of Sartre: "Bad faith rests on a vacillation between transcendence and facticity which refuses to recognize either one for what it really is or to synthesize them." What he means is that historical fiction writers purport to tell the truth about history because they get the historical details correct, while at the same time knowingly going beyond facts into emotions, which they are inventing. Litt says they are attempting to make the reader feel they know "how the past felt, or how the past felt itself to be as a passing present" (author's italics) when neither the reader nor the writer can possibly know that. He goes on to say that readers' knowledge of an historical period is actually corrupted by historical novels, and they come away from those novels knowing less than before. I won't reproduce all of my impertinent marginalia, but I'll tell you most of it concerns my confusion as to why Litt has such contempt for the intelligence of readers and writers. Since I'll never know, I'll just stick to my two other main points. First: Litt seems to have a sense that when it comes to history, there's such a thing as truth. "I believe most history books are written in good faith," he says, "which is to say, they are written in the honest hope of saying something useful and truthful about the past." But historians are human, too. They are biased, they have agendas of their own, and egos, and belief systems they wish to perpetuate or change. No matter who you are - novelist or historian - you see everything through a series of lenses. Whether you're looking into the past or the future or examining the present, you're never looking at anything directly or purely. Your self and your context contaminate everything you see. (No offense.) Historical fiction is not especially corrupted; everything is corrupted. Second: All of Litt's complaints about historical fiction can also be applied to regular old fiction fiction. All fiction writers are mixing facticity and transcendence. Their work is based on a reality we all recognize (fact), but their characters are made up (transcendence). If you're going to be that picky about how the past felt itself to be as a passing present, then why not be picky about male writers writing women? Or women writing children? Or writers writing any profession they haven't practiced? Or writers writing any experience other than their own? One feels Litt would prefer us to write autobiographies only. What bothers me the most about this essay is that Litt doesn't acknowledge that the genre of historical fiction includes Beowulf, Hamlet, the Waverly novels, and The Three Musketeers. The Iliad wasn't written down until centuries after the Trojan war, so it seems to me that that counts, too. These happen to be stories set in the past, but that doesn't detract from their value as art or indeed as historical documents telling us a good deal about the period in which they were written. I think, when judging the merits (of which there are many) and faults (of which there are many) of historical fiction, it's useful to begin with the assumption that these works do not come about randomly and are not created in a vacuum. They're a human response to a context, like any other work of fiction or nonfiction. And judging by the atrocities in Godless, that response often reveals, usually by accident, how far we still have to go to live up to our own ideals. The point is not what these works tell us about the past, but about what we choose to tell ourselves about our past. In fact, the inaccuracies in any given work might be the most interesting and revealing things to analyze. What must we change for the past to be palatable? What societal norms do we fudge to make our protagonists heroic? Whom do we bestow agency upon and whom do we try to hobble? What do we consider too vital to a sense of verisimilitude to ignore? What do we not have to change at all? 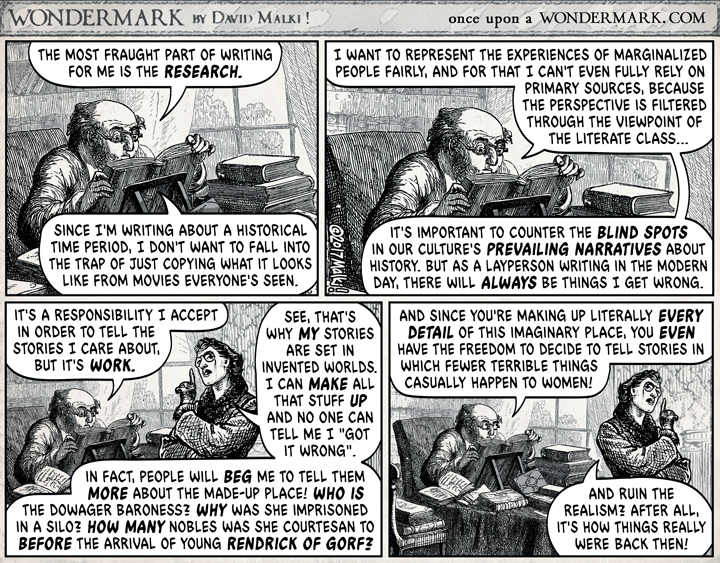 Wondermark updates on Tuesdays and Fridays. The comic in this post is called #1359; In which a Duty is shouldered. The Atlantic's review of Godless, "What Godless Says About America," was written by Sophie Gilbert and published on November 27, 2017. Toby Litt's essay, "Against Historical Fiction," is from Mutants, published by Seagull Books in 2016. Just for fun, here's a fascinating take on masculinity and disability in Godless. *Though you can blame them for choosing to tell a story significantly focused on white men in spite of the fascinating dramatic potential in all the smaller subplots surrounding non-white non-men.